All Community Relations requests, to include Color Guard and National Anthem singer, must fill out a DD FORM 2536. Just a little Throwback Thursday. Become an ambassador of the Arizona Air National Guard as a member of the 161st Air Refueling Wing’s Color Guard. Experience the pride of being a member of this precision team while attending high profile community activities such as professional sporting events, civic leader engagements, and many other patriotic themed gatherings. For more information contact the Color Guard’s NCOIC or OIC by emailing 161colorguard@gmail.com. Join the 161st Air Refueling Wing’s Security Forces Squadron and serve in one of the most transferable military occupations in the Air Force training as a law enforcement professional. For more information visit https://www.161arw.ang.af.mil/About-Us/Careers/ or download our mobile app today. Air Force Aircraft Fuel System Specialists are responsible for ensuring that all fuel systems on its aircraft are in working order. These Airmen advise on all manner of fuel system repairs, including removal, installation and maintenance procedures. If you are looking for a career in aviation maintenance and also want to serve your state and nation, take the first step by visiting https://www.161arw.ang.af.mil/About-Us/Careers/ or download our mobile app today. Check out our awesome maintainers!!! If you are looking to learn a new trade, find a meaningful career, or want to join our military family take a look at some of the career opportunities available at https://www.161arw.ang.af.mil/About-Us/Careers/ or download the mobile app today. Explore an exciting career in Public Health with the 161st Air Refueling Wing. Help keep Airmen healthy and ready to support our state and nation. For more information visit https://161.arw.ang.af.mil/About-Us/Careers or download our mobile app today. In the Air National Guard, you are not just part of a highly trained team, you are family. If you would like to become part of our extended family, contact a recruiter today visiting https://www.161arw.ang.af.mil/About-Us/Careers or download our mobile app today. If you are up to the task to protect and defend, make the call to one of our 161st Air National Guard recruiters by visiting https://www.161arw.ang.af.mil/About-Us/Careers or download our mobile app today. Members of the 161st Air Refueling Wing serve our state and nation in a variety of ways. From Aircraft Maintenance to Aircraft Electrical Systems, there are many career opportunities offered to members of the Arizona National Guard. 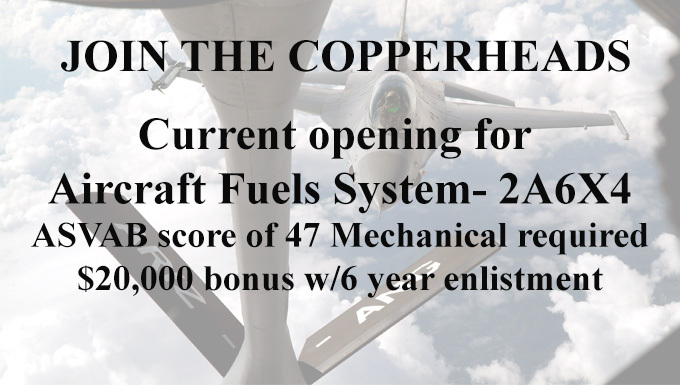 For more information visit https://www.161arw.ang.af.mil/About-Us/Careers/ or download our app today. Do you want to get paid to learn a new skill? You can in the Air National Guard. For more information visit https://www.161arw.ang.af.mil/About-Us/Careers or download our mobile app today.